Overall the whole results page is a little bland and boring. 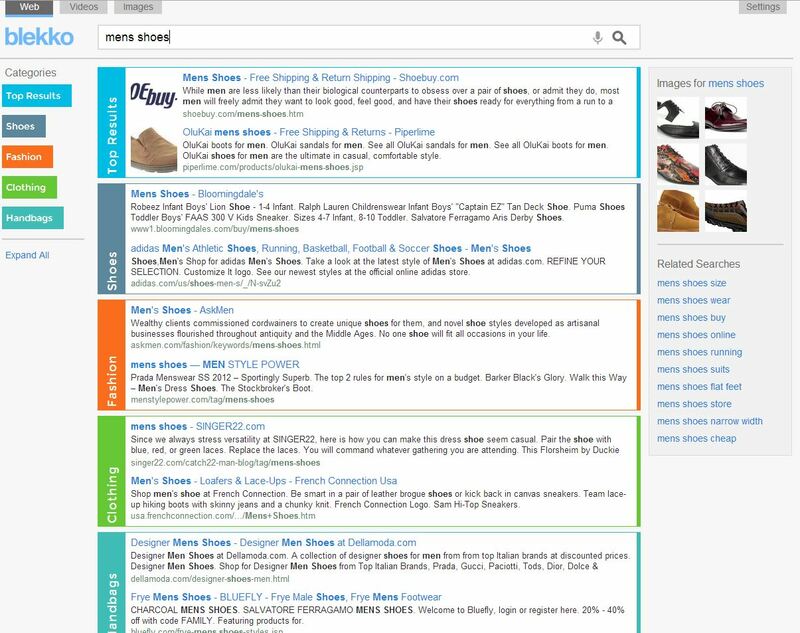 Product Listing Ads should probably be in there but there not for some reason – I guess [mens shoes] is a bit too broad a keyword to trigger PLA’s? The natural results are as you would expect – big brands like ASOS, the ubiquitous Amazon and Debenhams all feature highly – but only two natural results are placed above the fold. 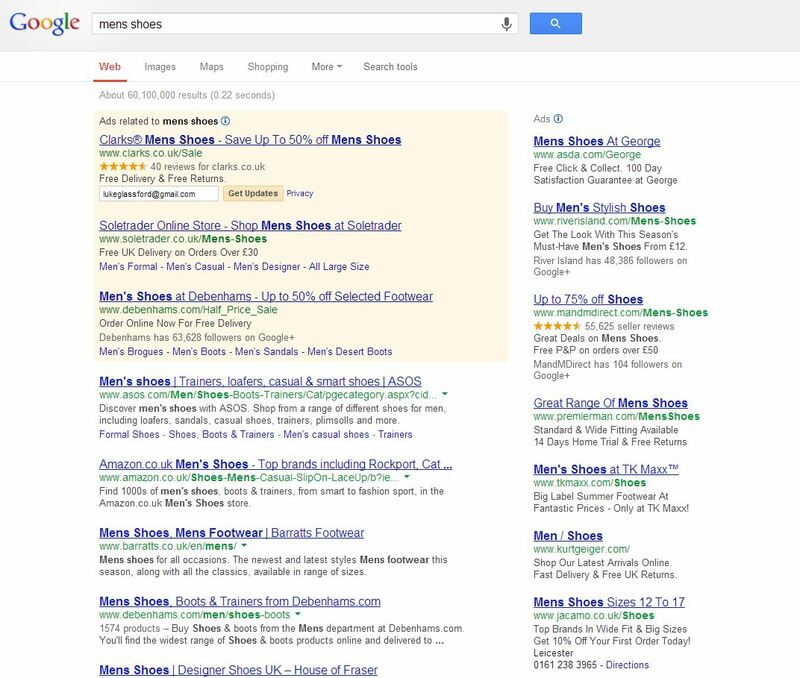 More ads are placed above the natural results than Google, but crucially makes better use of space so that three natural results are above the fold. 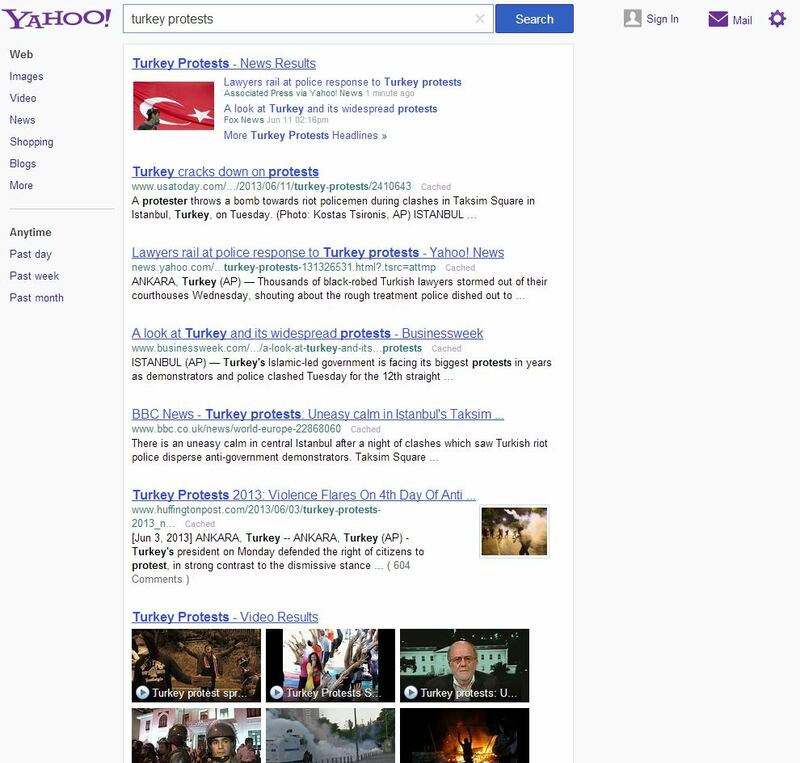 Stylistically Bing follows Google’s lead with a pretty dry and bland result. It’s interesting that the natural results are also dominated by brands, but different ones like Next, Brantano and eBay. 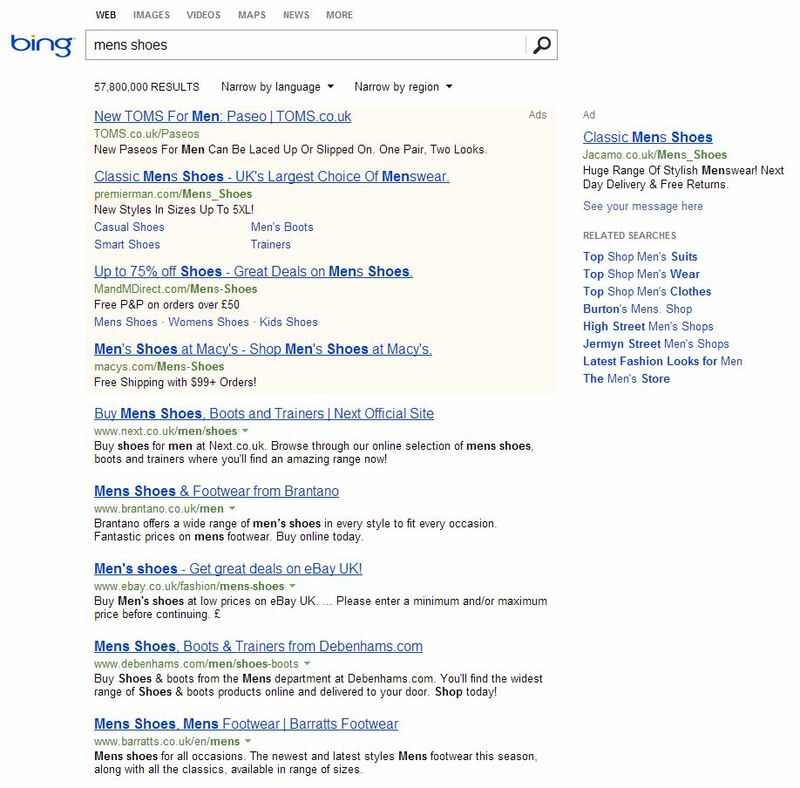 ASOS are number one on Google, and don’t even feature on the first page of results in Bing (at time of writing). Their new design is so similar to Google that this result is exactly what I expected Google’s to look like. Some nice product images are prominent and Zappo’s gets a huge listing underneath. 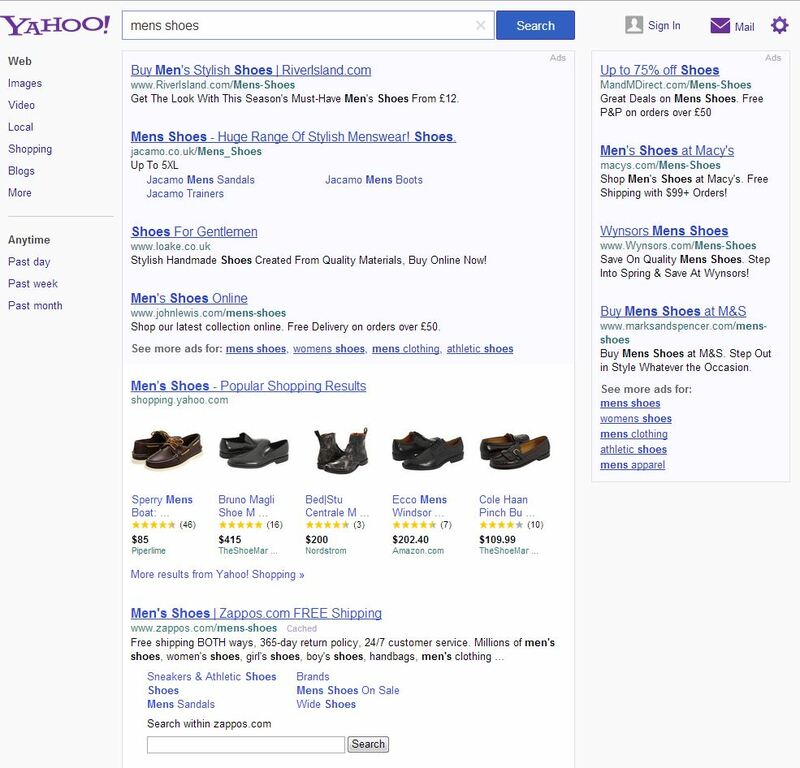 I quite like the direction Yahoo are taking with this, to be honest, although these are the US results as the new design isn’t available in the UK yet – so there is a noticeable difference in the order of sites compared to Bing. Other than the nice use of favicons to illustrate each result, the new pretender in search isn’t doing much interesting here. 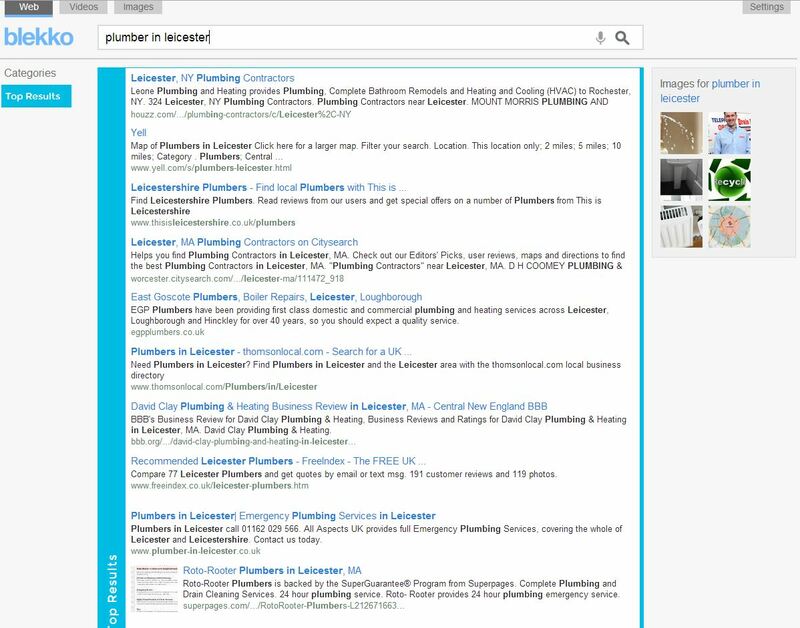 The ‘more from’ quick links to drill down to results specific to each site is also a nice touch, and an uncluttered SERP is certainly refreshing. It feels like more could be done to provide better options to searchers though. 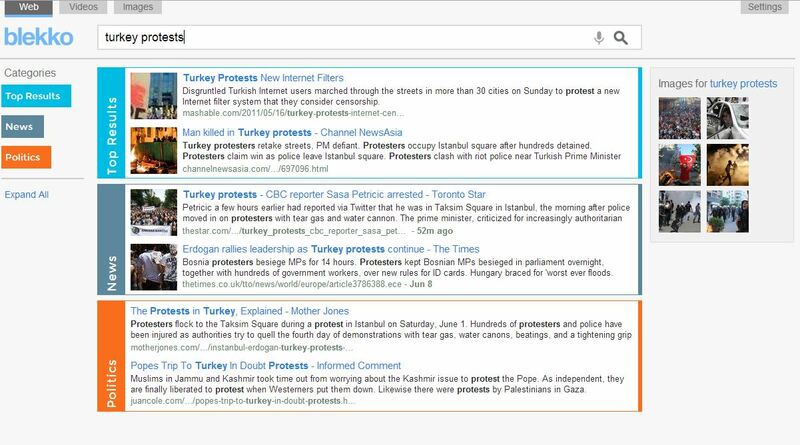 Blekko’s recent redesign is certainly ambitious, and it aims to categorise search results into intelligent sections – which can then be scrolled through independently. 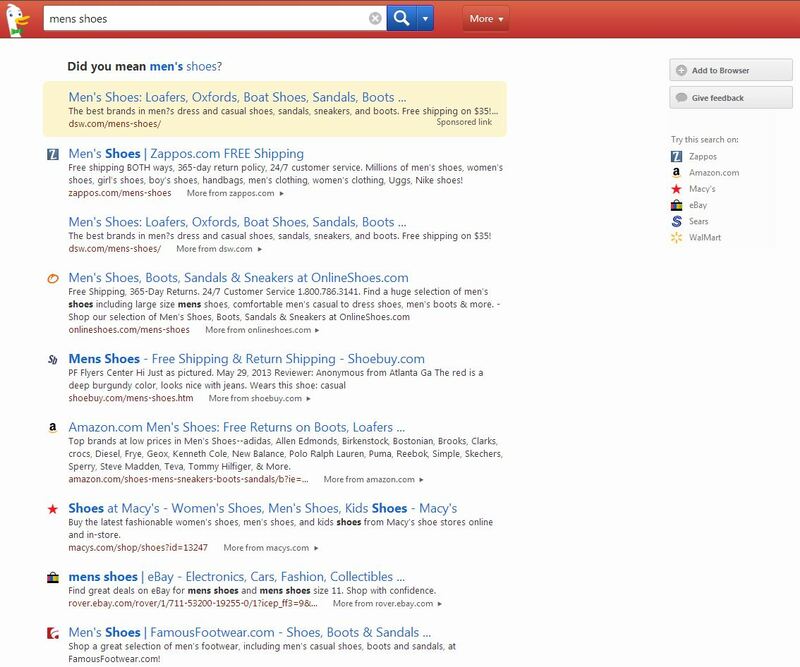 For some search terms, this can work brilliantly – for [mens shoes] though, it serves to complicate things. Should I be browsing the ‘top results’ section or the ‘fashion’ section? And why is there a ‘handbags’ section with links to sites that sell shoes!? I love what Blekko are trying to do, and their new approach has the potential to really shake up the search industry over time – it just needs more work I guess. 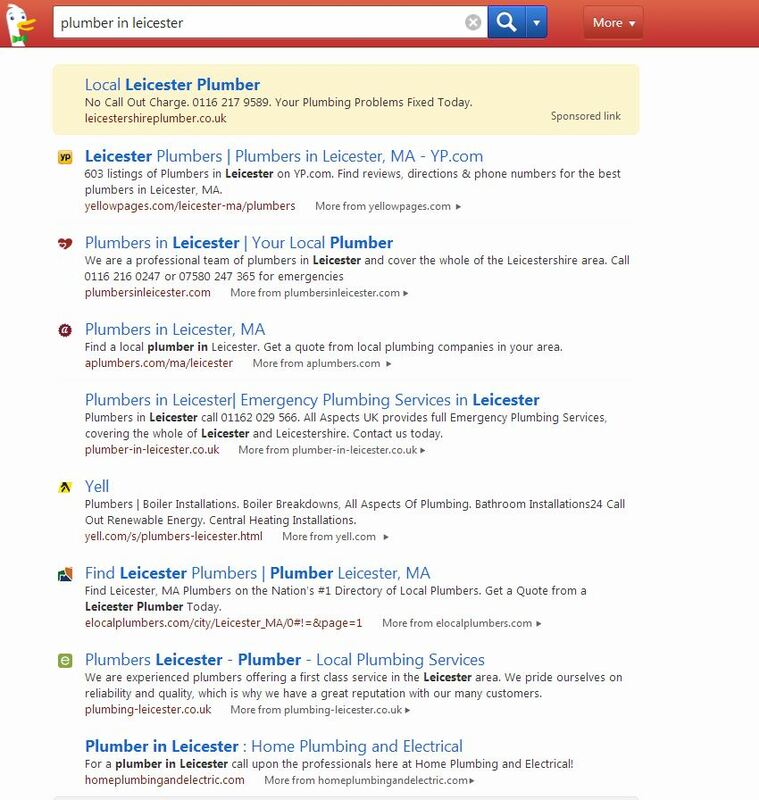 Bit more like it from Google, lots more options in the form of local listings and the map to complement the paid and natural results. The Venice Update is doing it’s job as well, making sure the natural results are full of local plumbers. 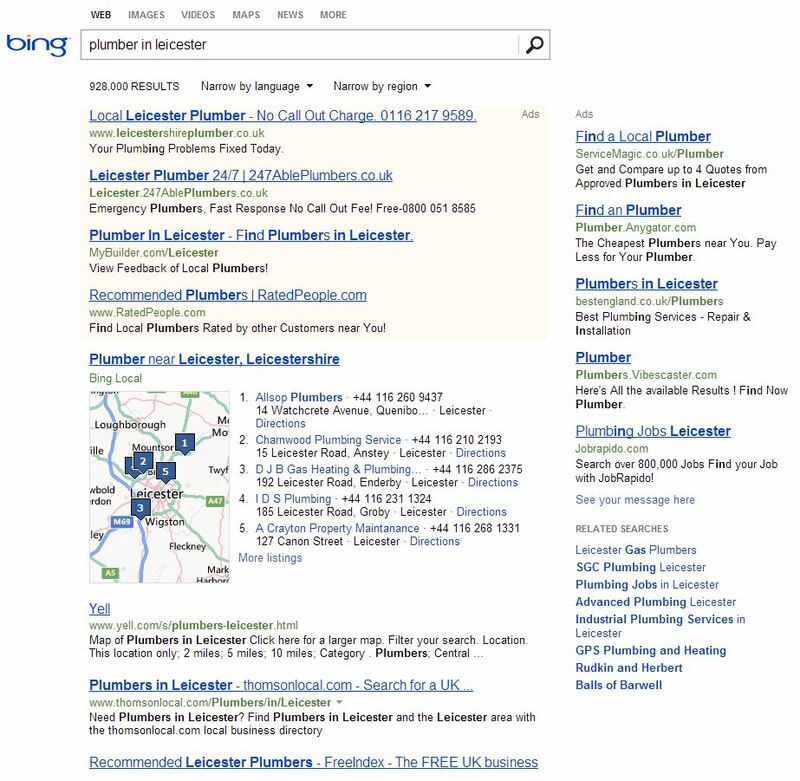 I much prefer Bing’s map than Google’s as it is much clearer and more targeted towards helping me pick out a business. There’s less local listings though, which equals less choice for the searcher, but Bing compensates by making directories like Yell and Thomson Local more prominent. Local listings don’t even get a look-in here for some reason, although they are on the UK version. 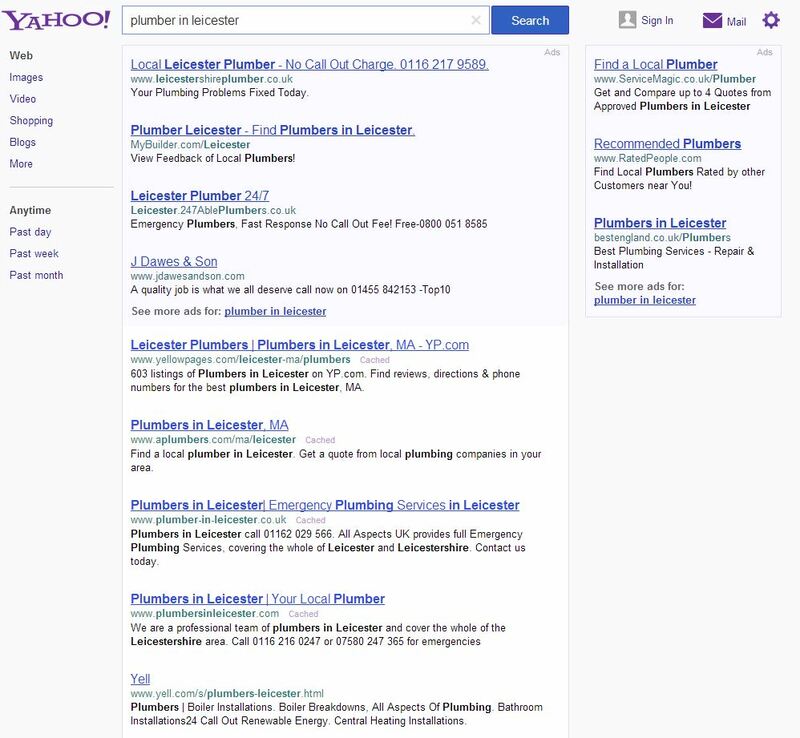 It all adds up to the feeling that Yahoo aren’t really concentrating on local/mobile search just yet. DuckDuckGo offer no new features to help searchers out, all we get is the tried and tested list of links to send us on our way. Again, its nice and clean – but ultimately not very helpful really. Now this is an example where Blekko’s approach could really make a difference. For now, it just batches all the results into the ‘top results’ which can be browsed horizontally. You can imagine in the future though that categories of results like ‘top rated’ and ‘directories’ could be included to help searchers further refine their search direct from the result page. For me, news is probably the biggest area of improvement for Google. With a news story as big and as widely covered as this one, search results should be much more intelligent and helpful. I could be searching here to find out what originally caused the protests, what is the very latest news on the issue, what are the more popular ‘opinion pieces’ on it, latest quotes etc… None of that is catered for on the search results – which instead just deliver lots of random headlines covering a variety of the different aspects of the story. Better organisation of the various sources and categorisation would be good. 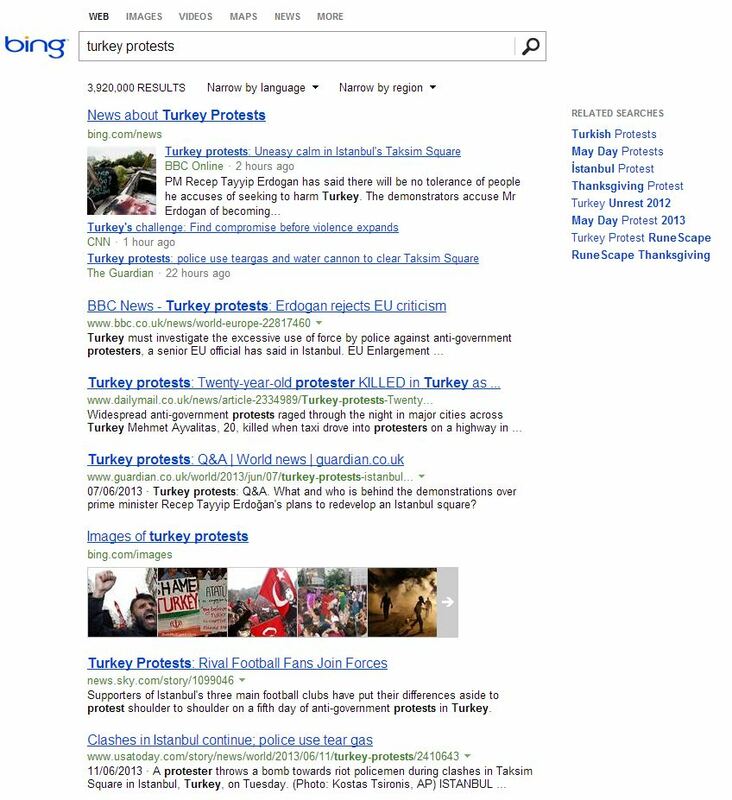 Same issues as Google really, although Bing gets extra marks for at least giving us the option to look at relevant pictures. 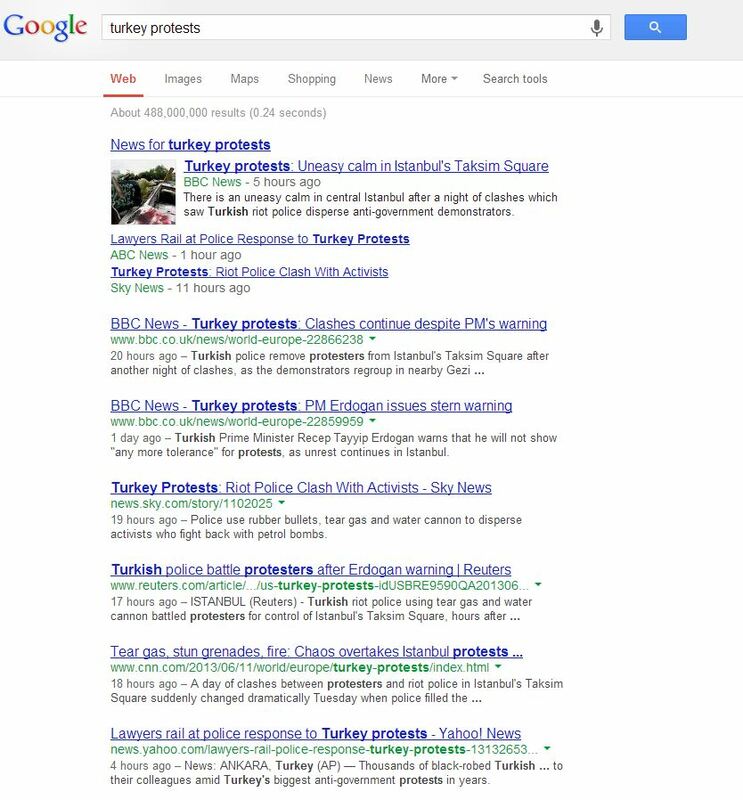 Again, there’s no discernible organisation or ‘timeline’ of all the various issues relating to the Turkey protests. Relevant videos rather than just images is a good inclusion though. 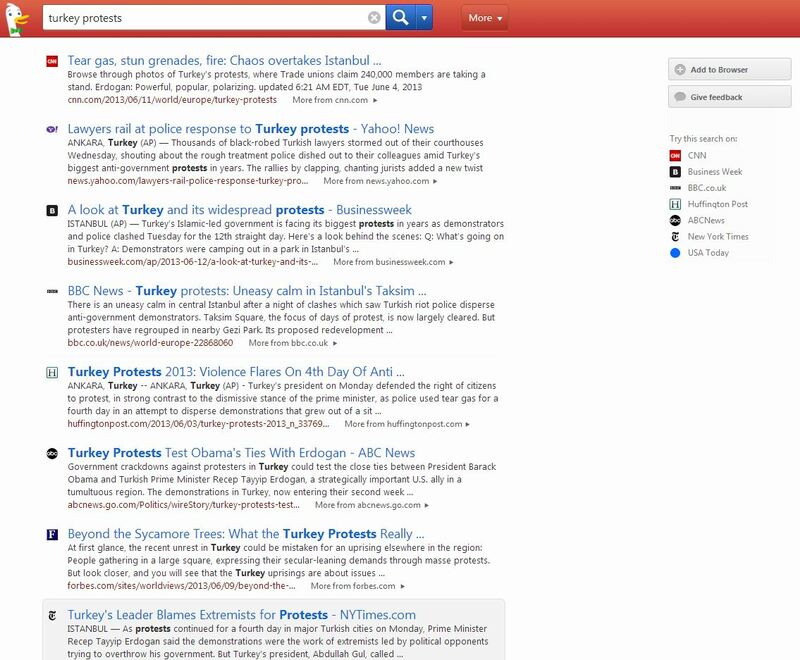 News is treated just like any other vertical by DuckDuckGo – with a clean looking list of links. Ideally the SERP should be alive with content regarding such a news story. This is just too static to provide any use other than the basic click-and-be-gone approach. You can definitely see Blekko’s potential with this result. A topical news event with lots of ongoing signals enables them to apply intelligent categories, splitting the results into ‘News’ and then ‘Politics’. Again, it obviously needs more work – but imagine it with categories like ‘historical context’, ‘interviews’, ‘videos’, ‘Twitter’ and you’ve got a much more rewarding and engaging search result. Unsurprisingly Google comes out on top, thanks to being consistently more feature-rich and reliable than the others, but it’s by no way a walkover. 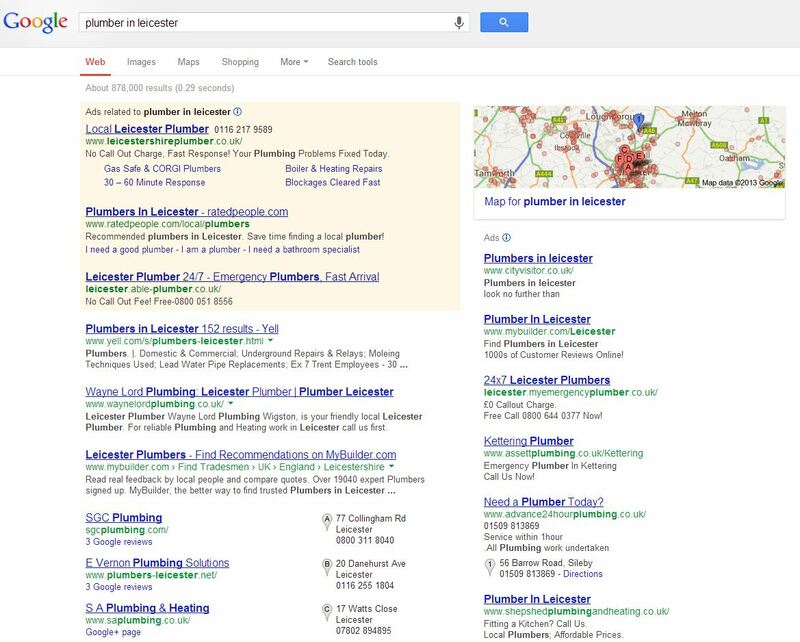 With the demands of searchers increasing sharply, more intelligence (perhaps from their Knowledge Graph) overlaid onto the search results must be something Google is looking at – as their SERPs are in real danger of becoming sterile and outdated. Particularly when compared with what Blekko are trying to do.